Iranian-American comedian Max Amini will give his long-awaited performance at The Madinat Theatre on January 4. In his show, stand-up comedian and actor delivers a strong message about family ties, cultural divergences and social topics through an array of eccentric impressions and novel storytelling. Max began his stand-up comedy career in 2002 at the LA Improv, and now performs live comedy across the world. From a Persian heritage, he has over 50 films and television credits as an actor including NBC’s Heroes and Comedy Central’s Mind of Mencia. What really sets him apart is his uncanny ability to improvise on the spot. 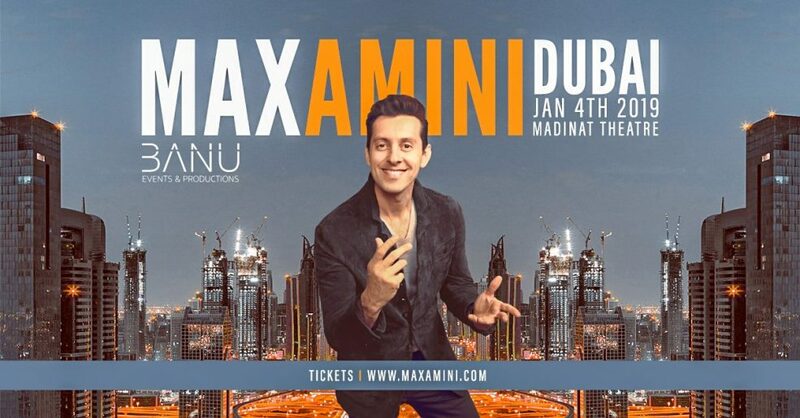 This makes him such a unique entertainer that it’s not uncommon for the audience members to sit through two Max Amini shows in one night and experience two completely different performances.